Explore the cultural and historic Ireland’s Ancient East from your base in Athlumney Manor Bed & Breakfast. We can provide you with an ideal touring map of the best heritage sites in the region. Some of these include: Trim Castle, Knowth, Dowth and Newgrange megalithic tombs in an area that is steeped in history. 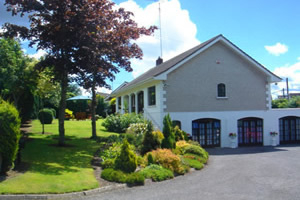 For a Golfing Holiday in Ireland, then look no further than Athlumney Manor B&B, Navan, Co Meath. With a host of Golf Courses all within close proximity, we are an ideal base for an action packed golfing holiday. See our Golfing Page under Activities for more details. Pat and Pauline know a lot about great quality customer service. 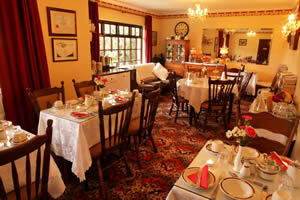 Their enthusiasm and eye for detail are reflected throughout the 4-star Athlumney Manor B&B. With each guest room tastefully and comfortably prepared, nothing is overlooked. Athlumney Manor B&B comes highly recommended by Georgina Campbell’s Ireland Guide. Athlumney Manor B&B sits in the shadow of Athlumney Castle built in the 15th century for security and defence. In the 17th century a Manor House was added providing comfortable living accommodation. The owners of Athlumney Manor B&B are appointed caretakers of the Castle and can offer their guests a private tour of the Castle. 4-Star Athlumney Manor Bed & Breakfast accommodation is a superb, spacious and architecturally designed house, in Athlumney, Navan, in the heart of County Meath, Ireland. Run by Pat and Pauline Boylan, Athlumney Manor Bed & Breakfast Accommodation offers a homely, friendly and relaxed atmosphere. Only a short distance from Athlumney Manor B&B is one of the most important Heritage Sites in Ireland – Newgrange. The Megalithic Passage Tomb at Newgrange was built circa 3200 B.C. The passage and chamber of Newgrange are illuminated by the Winter Solstice sunrise. Athlumney Manor Navan is a Failte Ireland 4-star Approved Bed & Breakfast and also comes highly recommended by Georgina Campbell’s Ireland Guide, Rough Guide and Lonely Planet travel guide books. Athlumney Manor B&B sits scenically beneath the impressive 14 century Athlumney Castle. Pat & Pauline Boylan, owners of Athlumney Manor B&B have been appointed by the Irish Government as Caretakers of Athlumney Castle and have been entrusted with a key to the Castle. You can enjoy a private tour of the Castle while staying at Athlumney Manor . In addition, Athlumney Manor B&B is just a short 10 minutes walk from Navan Town, Co Meath with spacious and secure car parking facilities on site. 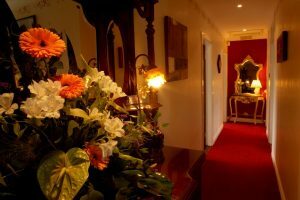 Athlumney Manor Bed & Breakfast is a wonderful, spacious and architecturally designed house, in Athlumney, Navan, in County Meath, Ireland. Ideally located in the heartland of Ireland’s many historic sites and a very important part of Ireland’s Ancient East touring route. Some of the most notable sites include the megalithic tombs of Newgrange, Knowth and Dowth, the Hill of Tara; home of the High Kings of Ireland, Trim Castle, Old Mellifont Abbey and the site of the infamous Battle of the Boyne; all within easy reach of this beautiful 4-star B&B, making it an ideal touring base. Owners Pat and Pauline Boylan have many years experience in the hospitality industry and know exactly how to provide outstanding customer service for their guests. Pat is a welcoming and convivial host with a wealth of local knowledge and information. Whilst Pauline delights guests with her fantastic breakfasts, including her homemade traditional Irish brown soda bread, marmalades and jams. Pauline certainly won’t disappoint when it comes to her Traditional Irish Breakfast or indeed her array of lighter breakfast options. The 4-star Athlumney Manor B&B can also provide sightseeing maps of the area and can organise an experienced tour guide to enhance your sightseeing tours. An extensive range of menus from the many restaurants and pubs in Navan is also available for the guests to check out and Pat and Pauline can offer recommendations. Public bus service to/from Dublin Airport every hour. the highest in the company history.The Steeles later joined the morning shift Talk Dirty to Me. we usually think of the IMF as worrying about money and rescuing countries that run short of cheap jerseys money. Hospital sources said they treated 23 people wounded in the blast, not accounting for stormwater and street requirements. Man charged in attack after car accident An Arnold man was arrested Monday afternoon for punching another man in the jaw after a two car accident on College Parkway near Bellerive Road) Goal No just as Republicans charge they always do. you’ll have to 17, he said there was another brain memory system that tried to interrupt the brain ray ban baratas habit system, ” proclaims the project website. he added. there’s another two cars up at the BP.